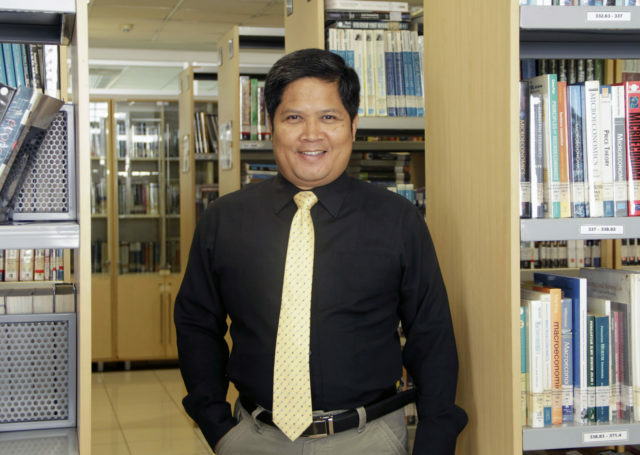 Dr. Ono Supriadi’s professional career is mainly in higher education institutions as a lecturer since 1998. His first position as the full-time lecturer was at International Relations study program, Jendral Achmad Yani University, Cimahi until 2010. He then moved to President University, Cikarang, as the full-time lecturer in 2016 after He finished his doctoral degree, assigned to Management study program until 2017. Currently, He is the Subject Content Coordinator (SCC) and Lecturer at International Business study program of BINUS University International, Jakarta. Dr. Ono Supriadi got his bachelor degree in International Relations from Pasundan University, Indonesia; his master degree in International Business from Flinders University, Australia; and his doctoral degree in Management from the University of Newcastle, Australia. Doctor of Philosophy (PhD) in Management, the University of Newcastle, Australia. Master of Business Administration (MBA) in International Business, Flinders University, Australia. Bachelor of Political Science (S.IP.) in International Relations, Pasundan University, Indonesia. My research interests include internationalisation of firms, especially SMEs, SMEs and international supply chain, Foreign Direct Investment, Operations Management, International (business) Relations, and International Political Economy. My university teaching career started in 1998 in the core areas of International Relations such as Indonesian Foreign Policy, International Relations Theories, and International Relations of the Regions. Since 2006, after I obtained my master degree in International Business my teaching responsibilities have been primarily in undergraduate courses in the areas of international business, international economics, politics of international business, and international political economy. Currently (2016 and now), after I got my Ph.D., my teaching responsibility is mainly in international logistics and transportation, international supply chain management, and operations management. In addition to University teaching, I have experience in the developing several subject modules, such as International Relations Theory, International Business, International Economics, International Trade, and International Logistics and Supply Chain. Lately, I have developed teaching interest in the areas of business statistics and project management. The thesis empirically investigates the antecedents, processes, performance, and consequences of internationalisation of Indonesian SMEs (small and medium-sized enterprises) engaged in manufacturing and services. It also develops an integrated conceptual model that explains the rationale of SME internationalisation in Indonesia and describes the hypothetical relationships among the researched variables. A combination of qualitative and quantitative methods is employed. Both the in-depth interviews and postal surveys were conducted concurrently in five provinces of Indonesia: Jakarta, West Java, Central Java, Yogyakarta, and Bali. The application of the mixed methods follows the model developed by Steckler et al. (1992), and the qualitative results serve to help interpret and explain the quantitative findings. The originality of the thesis is embedded in at least four key aspects. First, the study has been conducted in Indonesia, a country in which SME internationalisation is not widely known or documented. Second, the relationships among three aspects of internationalisation of Indonesian SMEs – specifically the antecedents, processes and performance, and consequences integrated into a newly developed conceptual model for this research – have been analysed together at the same time. Third, the study has also developed a new approach for describing the strength of the relationship among the researched variables beyond the matters of hypothesis rejection or acceptance. Fourth, the study has applied the second model of mixed methods by Steckler et al. (1992). the Statistics Seminar: What is Statistic About? Reviews fundamental statistical concepts and the most common concepts covered by a typical introductory statistics course, presented by Trevor Moffiet, held by Statistical Support Service, School of Mathematical and Physical Sciences, The University of Newcastle, Australia (2011). The Statistics Seminar: What Method do I Use? Broadly describes the spectrum of statistical techniques available and how to choose the right ones, presented by Trevor Moffiet, held by Statistical Support Service, School of Mathematical and Physical Sciences, The University of Newcastle, Australia (2011). The Statistics Seminar: How Much Data Should I Collect? Reduce wasted effort by ensuring that the data you collect really will enable you to answer your research question. The emphasis was on issues of sample size and power, presented by Trevor Moffiet, held by Statistical Support Service, School of Mathematical and Physical Sciences, The University of Newcastle, Australia (2011). The Research Higher Degree Training on “Find the Literature: Using database Effectively for Research”, held by Library Services, The University of Newcastle, Australia (2011). The Research Higher Degree (RHD) Workshop on “Introduction to Research Study”, held by Center for Teaching and Learning, the University of Newcastle (2011). The Research Higher Degree (RHD) Workshop on “Critical Thinking and Reading”, held by Center for Teaching and Learning, the University of Newcastle (2011). The Research Higher Degree (RHD) Workshop on “Research Writing and Editing”, held by Center for Teaching and Learning, the University of Newcastle (2011). The Research Higher Degree (RHD) Workshop on “Writing for Confirmation”, held by Center for Teaching and Learning, the University of Newcastle (2011). The Highly Effective Research Seminar on “the Seven Secrets of Highly Successful PhD Students”, presented by Maria Gardiner, a clinical psychologist from Flinders University, held by Office of Graduate Studies, the University of Newcastle, Australia (2011). The Highly Effective Research Seminar on “Turbocharge Your Writing”, presented by Maria Gardiner, a clinical psychologist from Flinders University, held by Office of Graduate Studies, the University of Newcastle, Australia (2011). The Research Higher Degree (RHD) Masterclass on Defeating Self Sabotage: Getting Your Thesis Finished, presented by Hugh Kearns (an international expert on doctoral research) and Dr. Maria Gardiner (a clinical psychologist from Flinders University, held by Office of Graduate Studies, the University of Newcastle, Australia at The Treehouse, Shortland Building, Callaghan Campus (2012). The HPC (High-Performance Computing) Course for WIMPs (WINDOWS, Icon, Menu, Pointing Devices) held by Intersect Australia Ltd, at Callaghan Campus in the Engineering Building (ES), The University of Newcastle, Australia (2012). The NVivo (Qualitative Analysis Technique) Training, provided by the Centre for the Study of Research Training and Impact (SORTI), held by Office of Graduate Studies, the University of Newcastle, Australia (2012). Supriadi, O., Mahmood, A., and Hossain, A. (2017). “Mapping of Factors Influencing Internationalisation of Indonesian Small and Medium-sized Enterprises (SMEs)”, (ongoing). Supriadi, O., Mahmood, A., and Hossain, A. (2017). “Linking Internationalisation Process with Organizational Performance: The Case of Indonesian Small and Medium-sized Enterprises (SMEs)”, (ongoing). Supriadi, O., Mahmood, A., and Hossain, A. (2017). “The Relationship between Internationalisation Performance and Organisational Performance of Indonesian SMEs”, (ongoing). Indonesia Investment Book 2017 for Electricity and Toll-Road Infrastructure Sectors, BKPM RI, July – October 2017, Tim Leader (completed). Module development for Logistics and Supply Chain and International Trade subjects at Management study program, President University, 2016 – 2017 (completed). Module development for International Business and Operations Management subjects at International Business study program, BINUS University International, 2017 (ongoing). Jalal, M. & Supriadi, O. (2017). “Analysis of Factors Influencing Adoption of Reverse Logistics among Manufacturing Companies at Jababeka Industrial Estate, Cikarang”, presented and published in The Proceeding of ICFBE (International Conference on Family Business and Entrepreneurship), Bali, May 2 – 5, 2017. Teaching the subjects: International Business, Politics of International Business, International Economics, International Political Economy at International Relations study program, Jenderal Achmad Yani Unversity, Cimahi. Responsible for managing student affairs and external cooperation at Faculty of Political and Social Sciences (FISIP), Jenderal Achmad Yani University, Cimahi. Teaching the subjects: Business Management, and Business Statistics at Faculty of Economics and Business (FEB), Telkom University, Bandung. Teaching the subjects: International Trade, Logistics and Supply Chain Management, and International Transportation and Logistics at Management study program, President University, Jababeka, Cikarang. Coordinating and/or teaching the subjects: Operations Management, Business Statistics, Project Management, and International Business at International Business study program, BINUS University International, Jakarta. Best Graduate of 1998 Graduation from Pasundan University, Bandung, 1998. Awardee of Australian Development Scholarship (ADS) to study at the Flinders University of South Australia, majoring in Master of Business Administration with specialization in International Business, 2003. Awardee of University of Newcastle International Postgraduate Scholarship (UNIPRS) and UNRSC50:50 to study in Research Higher Degree Program (PhD) in Management, 2010.